This Battery was organized October 27, 1861, under Captain A.G.A. Constable, who soon resigned and was succeeded by Captain Frank C. Sands. It rendezvoused at the St. Louis Arsenal and operated in Missouri under Fremont, and under Pope at New Madrid and Island No.10. After the battle of Shiloh it moved upon Corinth. In September, 1862, it fought at Iuka under Rosecrans, resisting desperate charges of the enemy, with a loss of 57 men and many horses. Again at Corinth it hurled back with cannister heavy assaults of the Rebels. The Battery moved with Grant's Mississippi expedition, and in the spring of 1863 joined in the grand movement around Vicksburg, taking active part in the battles of Raymond, Jackson and Champion Hills. In September it moved with General Street's expedition into Arkansas and remained in that state until mustered out November 5, 1864. 11th Independent Battery Light Artillery. Battery organized at St. Louis, Mo., and mustered in October 27, 1861. Attached to Army of the West and Dept. of Missouri to March, 1862. Artillery, 2nd Division, Army of Mississippi, to April, 1862. Artillery, 3rd Division, Army of Mississippi, to November, 1862. 7th Division, Left Wing 13th Army Corps, Dept. of the Tennessee, to December, 1862. Artillery, 7th Division, 16th Army Corps, to January, 1863. Artillery, 7th Division, 17th Army Corps, to July, 1863. Kimball's Division, Arkansas Expedition, to August, 1863. 2nd Brigade, 2nd Division, Arkansas Expedition, to January, 1864. Artillery, 2nd Division, 7th Army Corps, Dept. of Arkansas, to May, 1864. Garrison Pine Bluff, Ark., 2nd Division, 7th Army Corps, to November, 1864. SERVICE.--Moved to South Point, Mo., October 28, 1861. March to Syracuse, Mo., November 22, thence to Tipton, Mo., November, 29, and duty there till December 15. Moved to Otterville, Mo., December 15, and duty there till February 2, 1862. March to Booneville, thence to St. Charles, February 2-17. Siege of New Madrid, Mo., March 3-14. Siege and capture of Island No. 10, Mississippi River, March 15-April 8. Expedition to Fort Pillow, Tenn.. April 13-17. Moved to Pittsburg Landing, Tenn., April 17-23. Advance on and siege of Corinth, Miss., April 29-May 30. Pursuit to Booneville May 30-June 13. Duty at Corinth till June 23. Expedition to Ripley June 27-July 2. At Corinth till August 4. At Jacinto till September 18. Battle of Iuka, Miss., September 19. Battle of Corinth October 3-4. Pursuit to Ripley October 5-12. Grant's Central Mississippi Campaign November-December. At Germantown, Tenn., till January 15, 1863. At Memphis, Tenn., till March. Yazoo Pass Expedition and operations against Fort Pemberton and Greenwood, March 11-April 5. Moved to Milliken's Bend, La. Movement on Bruinsburg and turning Grand Gulf April 25-30. Battle of Thompson's Hill. Port Gibson, May 1 (Reserve). Battle of Raymond May 12. Jackson May 14. Battle of Champion's Hill May 16. Siege of Vicksburg, Miss., May 18-July 4. Assaults on Vicksburg May 19 and 22. Ordered to Helena, Ark., July 28. Steele's Expedition to Little Rock, Ark., August 10-September 10. Bayou Fourche and capture of Little Rock September 10. 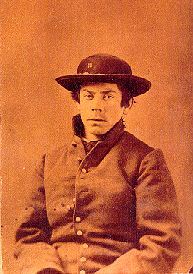 Duty at Little Rock till April, 1864, and at Pine Bluff till October. Ordered home for muster out. Mustered out at Columbus, Ohio. November 5, 1864, expiration of term. Battery lost during service 20 Enlisted men killed and mortally wounded and 30 Enlisted men by disease. Total 50.